Who says small isn't powerful? Intel don't, as their 8th Gen NUCs prove it is possible! Get ready for spectacularly responsive performance from the Intel NUC Mini PC kits with 8th generation Intel Core processors. The latest generation of Intel NUC kits let you build the exact system you want. From choosing chassis size to memory options to picking the storage you want, the benefit of building up an Intel NUC kit is the ability to completely customise the kit for a specific usage. Whether editing photos, streaming media, or setting up a second PC, the Intel Mini PC kits deliver the features people want in a size that fits easily into any lifestyle and any room in the house. The Intel Mini PC kit include a true quad-core 8th generation Intel Core processor (i5 and i7 only), which delivers a big jump in performance compared to the previous generation Intel 7th Gen NUCs. Whether it's built to create content or look at photos with 4K UHD graphics for picture perfect entertainment, the Intel 8th Gen Mini PC kits give great visual immersion with all of them featuring Iris Plus Graphics 655 and the unprecedented performance of Intel Core processors. The slightly taller Intel "H" suffix has the same processor and graphics, but also has room for a 2.5" HDD and is Intel Optane memory ready. By coupling a 2.5" HDD and Intel Optane memory, performance improves dramatically with up 1.4 faster media loading, opening large media files 3 faster, and completing daily tasks up to 2x faster. The Intel NUC Mini PC kits have chassis that are connectivity powerhouses; coming with Thunderbolt 3 which supports up to 40 GBps of data transfer, and four USB 3.1 Gen2 Type-A ports to bolster productivity for moving big media files around and providing room for peripherals. There's room for an M.2 SSD, and they also come with two additional USB ports via 1x4 internal headers. The Intel NUC Mini PC kits support triple displays all in 4K Ultra HD, with an HDMI 2.0a port and DisplayPort 1.2 via USB-C, so images or work can be shown across three screens without losing fidelity. 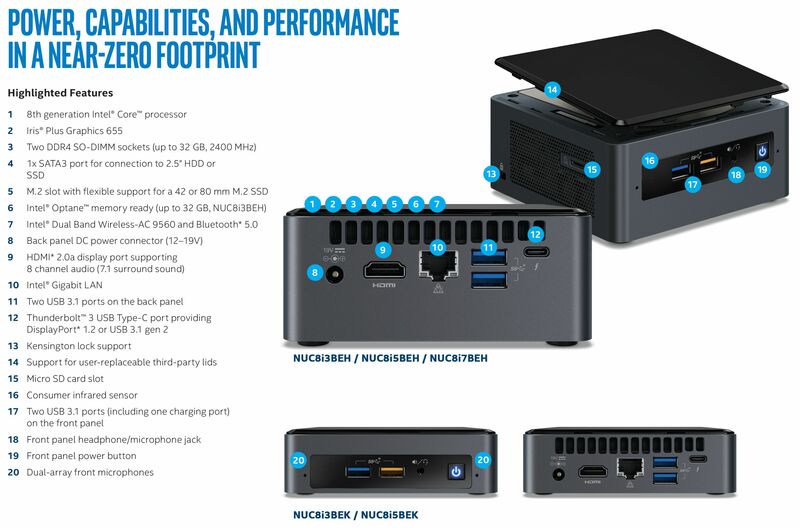 In a footprint that's almost zero, especially when compared with a tower, the Intel Mini PC kits can be custom built to have the performance and features of a desktop PC in a device that fits in the palm of your hand. The small size means the Intel NUC can be positioned almost anywhere, from behind a display to tucked discreetly in an entertainment center. Moreover, with improved cooling, fan noise is minimal, which means a quieter experience no matter where the Intel NUC is located. *Thunderbolt 3 is a very high-speed (40Gbps), daisy-chainable interface that allows connection of multiple peripherals and displays to a computer. Thunderbolt 3 uses a USB Type-C connector which combines PCI Express (PCIe Gen3), DisplayPort (DP 1.2), USB 3.1 Gen2 and provides up to 100W of DC power, all in one cable.